The Daintree rainforest is home to many unique forms of plant and animal life and Ocean Safari offers just one of the many wonderful Daintree tours available in this special region. This World Heritage area in Tropical North Queensland is located north of Cairns and Port Douglas, stretching 95kms along the coast where tropical rainforests meet pristine beaches and the Great Barrier Reef. From Daintree Village across the river, the Daintree encompasses Cape Kimberley, Cow Bay, Thornton’s Peak, Cooper Creek, Thornton Beach, Noah Valley, Cape Tribulation and the Bloomfield Track to the north. North of the Daintree River, the World Heritage rainforest has not changed in thousands of years making it the oldest living tropical rainforest on earth. 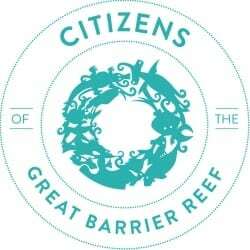 This is incredibly important to the Great Barrier Reef which is at its closest point to the mainland in this area. The reef is pristine and does not suffer from silting and runoff created by agriculture. Through participation in the Great Barrier Reef Marine Park Authority’s “Eye on the Reef” Monitoring Program, Ocean Safari actively contributes to coral reef science, reef health & understanding and environmental education. We collect valuable scientific data because we care about the future health of the Great Barrier Reef. 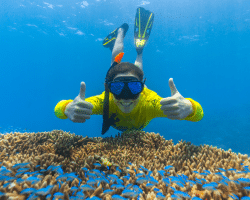 Stay a little bit longer before or after your Ocean Safari Great Barrier Reef adventure and explore the beauty of this famous region with other Daintree tours.